Jakub Vrana and Tom Wilson each had a goal and an assist, and Nicklas Backstrom had two assists for Washington. Braden Holtby stopped 24 shots, and Ovechkin added an assist as the Capitals won for the fifth time in seven games after dropping seven straight. 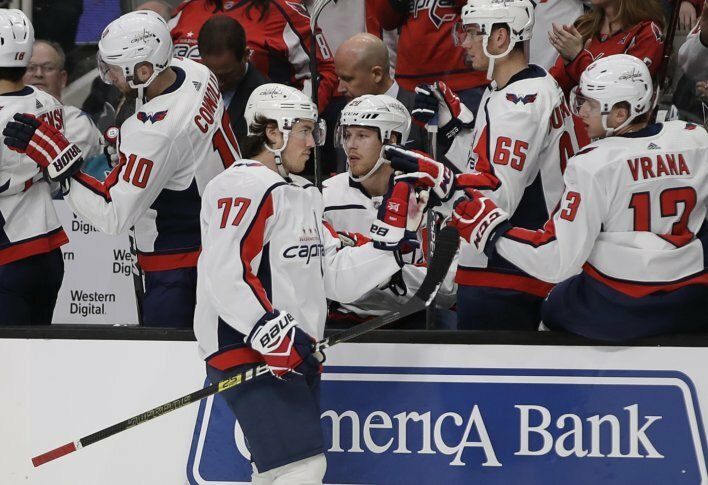 SAN JOSE, Calif. (AP) — T.J. Oshie got the Washington Capitals going Thursday night, and Alex Ovechkin helped poured it on from there. Ovechkin scored his NHL-leading 39th goal, Oshie had two goals and an assist, and the Capitals beat the San Jose Sharks 5-1. With the Capitals trailing 1-0 early, Oshie’s power-play goal in the first period turned the game around. Oshie reached a milestone with his 500th career point later in the game. He has 16 points (five goals, 11 assists) in his last 13 games. San Jose ended a six-game winning streak, which began with a 7-6 overtime win at Washington on Jan. 22. Sharks goalie Martin Jones turned back 18 shots. The Sharks took an early lead on Kevin Labanc’s 11th goal at 2:06 of the first period, but it was all Washington after that. Oshie tied it on a power play less than two minutes later, and Vrana scored midway through the first period to give Washington a 2-1 lead. Ovechkin scored at 4:14 of the second period, and Oshie connected on his 18th goal with just under two minutes before the second intermission. Wilson added an empty-netter with 2:35 left in the game. The loss knocked San Jose out of sole possession of first place in the Pacific Division. The Sharks fell into a tie with Calgary, which picked up a point in a shootout loss to Florida. San Jose and Calgary are in a three-way tie atop the Western Conference with Winnipeg, which lost to Colorado. The Capitals remain in second place in the Metropolitan Division, three points behind the New York Islanders, who defeated Columbus. NOTES: Sharks D Erik Karlsson (groin injury) missed his ninth straight game, but the six-time All-Star appears to be moving closer to a return. Karlsson practiced Wednesday and participated in Thursday’s optional skate. … Sharks C Joe Thornton had an assist on Labanc’s goal, moving the 39-year-old past Hall of Famer Teemu Selanne for 15th on the NHL’s career points list with 1,458. … The Sharks had won 13 of their previous 16 games. … Labanc’s goal was his fifth in five games. … Capitals F Dmitrij Jaskin, a scratch the last two games, replaced C Nic Dowd in Thursday’s lineup. … Ovechkin has 14 points (six goals, eight assists) in his last nine games. Washington: At Anaheim on Sunday. San Jose: Hosts Vancouver on Saturday.